2018 on the surface doesn’t seem like a transition year for Garbage Pail Kids. However, when history looks back on 2018 the signs of transition have clearly begun. The biggest news of the year in the hobby was the resignation of Brand Manager/Art Director Colin Walton from Topps. With Colin moving on in late summer to a new job with another company, GPK was left with new internal leadership and art direction. The markings of transition are just now beginning to be seen. Colin had already completed the majority of work on 2018S2 Oh the Horrible before leaving. 2019S1 We Hate the 90’s was also well on its way to being finished, and will mark Colin’s last input into the GPK brand. While we might not see true change begin until 2019 Series 2, there are signs. The second half of 2018 saw a sharp decrease in online sets. Gone are the holiday/awards sets at least for now. Their replacement was a GPK On Demand set that saw great value but probably the worst distribution by a Topps online set to date. It’s clear there will be changes to the future of the brand. Colin might be the last Brand Manager at Topps to have been a fan of GPK, and an artist himself. I predict collectors will see some changes big and small in 2019 within the GPK brand. New leadership will be tasked with putting their own stamp on the brand moving forward. Collectors can hope that leadership at Topps listens to mainstay artists like David Gross, Brent Engstrom, and Joe Simko as they use their artistic influence on future sets. Beyond just being the start of transition for the brand, 2018 saw many GPK highlights for collectors. Both retail sets released in the US were well received by collectors overall. 2018 saw the first European retail releases by Topps Europe in a decade. 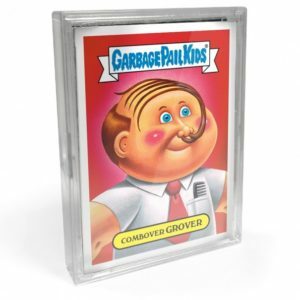 The licensing arm of Topps remains in full force as collectors saw the GPK license continued to used throughout the year with a variety of new merchandise to enjoy. Collectors once again had a lot to be excited about in 2018. But what stood out as the best in GPK for 2018? Its time for the 2nd annual 2018 GPKNews.com Best of GPK Awards! Winners have been selected by the editor of GPKNews.com in seven categories. Additionally, a Reader’s Choice winner was also named in each category. Readers of GPKNews were able to vote in a poll on GPKNews’ Facebook page in mid-December. On some awards there is agreement, while others vary in opinion. Let the debate begin! Its time to celebrate the best in GPKs for 2018! There was a clear winner in this category in 2018. 2018 Series 2 Oh the Horror-ible in some ways was a love letter from GPK artists to their fans. 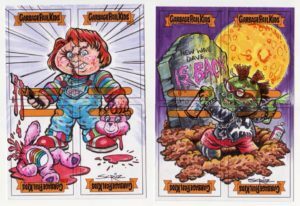 The horror theme not only resonated with the artists, but also with most GPK collectors. While the artists always spend ample time creating new cards, the time and thinking put into the last set of 2018 was unprecedented. Hundreds of gags were submitted to Topps from the artists for this set. This resulted in a set filled with many memorable cards that both GPK collectors and horror fans enjoyed. The set also saw the introduction of the purple Jelly parallel inserted into retail fat packs. Collectors took a liking to those, and the purple parallel set was one of the more chased parallel sets in recent memory. 2018S2 Oh the Horror-ible will be tough to top in 2019. When it comes to online GPK sets there was a sharp decline in what Topps offered collectors in 2018, especially in the second half of 2018. Topps started off the year with the usual suspects, awards sets, followed by comic convention sets and holiday sets. However it become obvious in the later part of 2018 that Topps started changing direction and begun experimenting with their online offerings. Those second half of 2018 offers is what stood out in collectors minds. The clear winner in the category was a set based off of the hugely popular Netflix Show, Stranger Things. Painted entirely by artist Joe Simko, Stranger Kids was first offered at this years New York Comic Con. People attending the show could purchased the “A” set or the “B” set for $20 each. People buying both sets got to choose one of four Comic Con exclusive bonus cards. Because of the scarcity and hard to obtain nature of the bonus cards, demand skyrocketed in the weeks right after the show for the bonus cards. In true Topps form, a mistake led to distribution of a fifth bonus card early on the first day of the show. Very few copies of the card, Topps did not have permission to distribute, were handed out and are now very rare collectors items. After the show was over Topps begun selling both the “A” and “B” sets on their website for 90 days. At press time the sets still remain for sale, so total print run information has not been made available. The artwork and frenzy for the bonus cards made this the most popular online set in 2018. Honorable mention: 2018 On Demand GPK Meme, 2018 GPK Summer Comic Convention, 2018 GPK Hall of Lame. For the second year in a row Creepy Co. wins the award for the licensee of the year. The company continued to release a steady stream of merchandise throughout the year. Mainly sticking with t-shirts, the company cooled on the idea of offering pins, but still offered up some innovating merchandise. They teamed up with Topps at SDCC to offer exclusive lanyard and pin. They finished the year offering an Adam Bomb desk light in a collectible OS 3 themed box. They had some strong competition from Funko, who begin offering GPKs in their standard POP line of figures. As well as from Fright Rags who offered a wax wrapper set with shirt, pin and card. Can Creepy Co. make it three in a row in 2019? With GPK the Game set to launch in 2019, as well as other merchandise sales, competition will be tight. Honorable mention: Funko, Fright Rags. 2018 saw Topps put the brakes on new sketch artists for the first time in years. The last three years saw the number of sketch artists increase substantially. In 2014 there were a dozen sketch artists. Retail sets now routinely feature almost 60 artists. However, Topps seems to have a steady bank of artists, and are now just replacing the few that drop out each set. 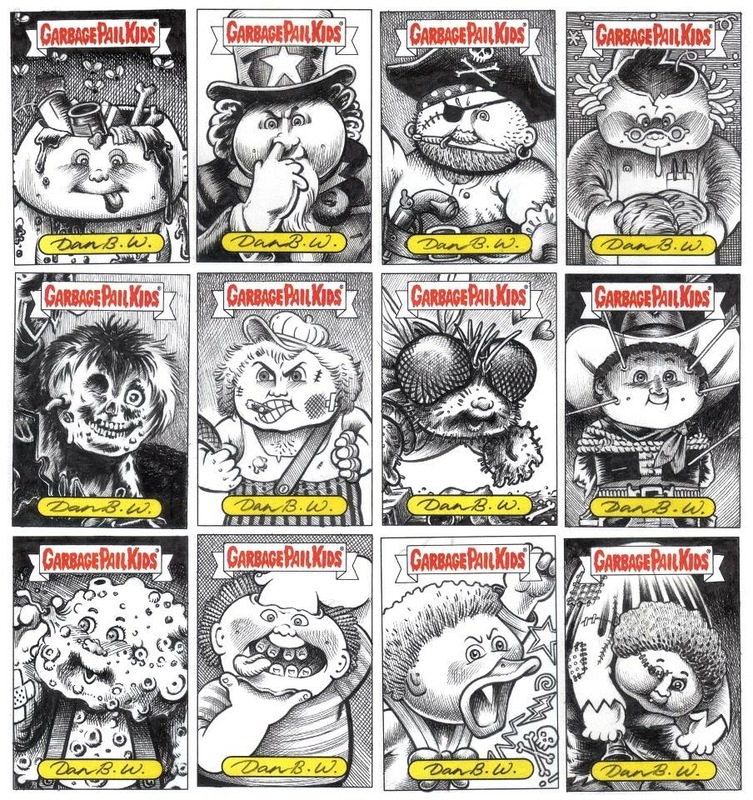 2018 saw only 8 new sketch artists make their debut on the GPK brand. All 8 did a fantastic job with their debut sets. There is no right or wrong answer for this category. The readers proved that with their voting. This year’s Rookie Sketch Artist of the Year is Shawn Cruz. Shawn integrated himself effortlessly into the GPK sets. His full color work on retail sketches were a welcome sight for collectors. His has done numerous personal sketches and GPK theme character work for clients. He’s also active in the comic con scene in the pacific northwest. Shawn will be a welcome addition to GPK sets for many years to come. Honorable mention: Quinton Baker, Simon Jacobsohn, Emma Burges, Ande Moores. This is another category where it’s nearly impossible to pick a winner. 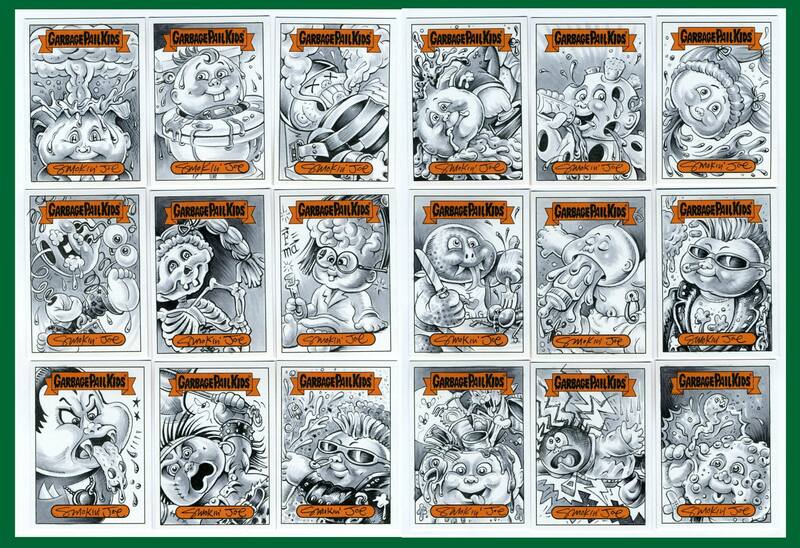 A seemingly impossible 72 artists completed sketches for GPK sets in 2018. this year both 2018S1, 2018S2, and the On Demand Meme set featured sketches. This is another category where readers have their favorites. In addition to the nominees there were 10 other artists who received votes. This year’s sketch artist of the year is Smokin Joe McWilliams. Smokin Joe has quickly become a favorite of collectors since starting with the GPK brand on the 2017S1 set. His attention to detail really shows on his pack inserted sketch work. Collectors constantly pay top dollar for his sketches, and Joe quickly sells out of sketch returns each set. Joe’s work was featured in all three sets that offered sketches this year. Despite clearly being busy with sketches and final artwork, his consistent quality is what stood out among collectors, and what makes Smokin Joe this year’s Sketch Artist of the Year. Honorable mention: Michael Barnard, Pat Chaimuang, Jason Heil, Rory McQueen, Steve Potter, Neil Camera, Lowell Isaac. 2018 saw 12 different artists paint final cards for GPK. However, one thing you notice right away, compared to 2017, there were a lot less cards made. This is because of the sharp decline in both daily and monthly online sets. Still, the artists were kept pretty busy. It’s always interesting to look at how many cards each artist did. 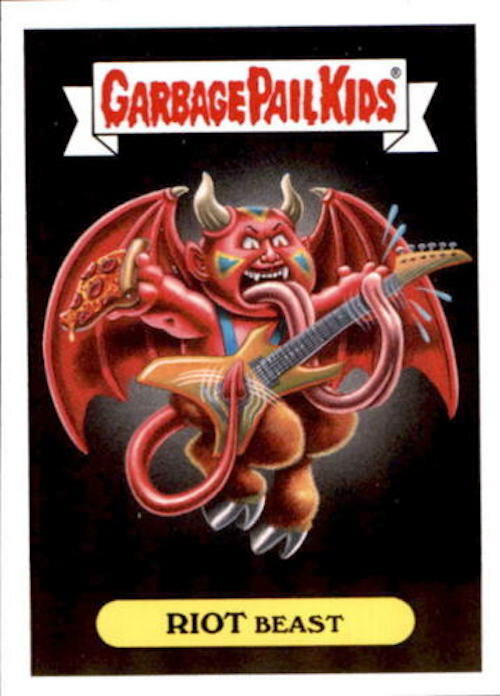 Here are the top 5 artists based on number of completed GPK cards. These numbers include both retail and online cards. 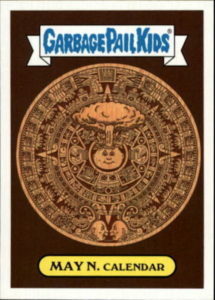 They do not include any Wacky packages cards that were part of online sets. Once again you will see the same names completing the most cards. However, you’ll notice Smokin Joe creep in at number 5 for the year. I’m willing ti predict there will be more change to this list in 2019. This is another category that’s really hard to pick. 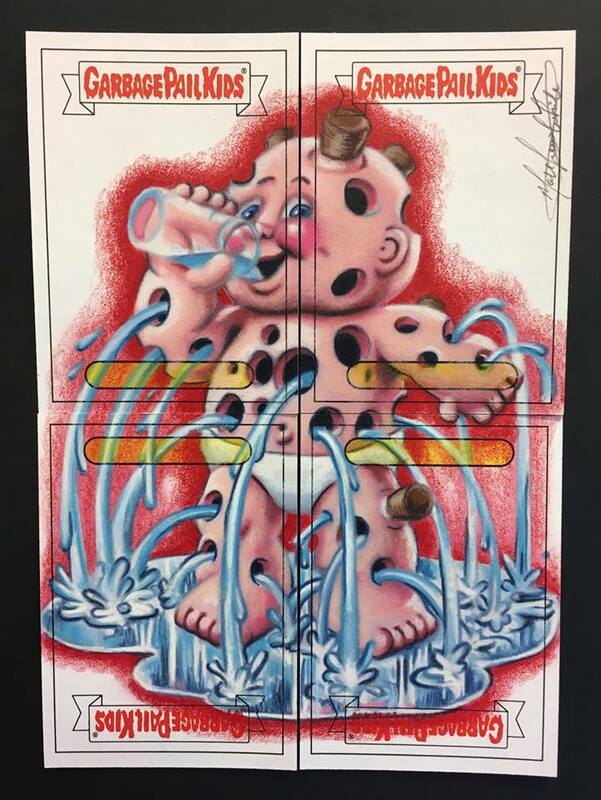 GPKNews has chosen David Gross as the 2018 GPK Artist of the Year. David’s strong suit has always been gag writing, and this year was no exception. He is able to write/draw gags that are both simple to understand, while remaining entertaining. A number of his cards in both retail sets stood out in 2018. David has also been a big supporter of the collector behind the scenes with Topps. His work with both the old and new GPK leadership will hopefully lead to some changes in 2019 that collectors will certainly enjoy. Honorable mention: Brent Engstrom, Joe Simko, Smokin Joe McWilliams, Neil Camera. There were almost 300 different GPKs released by Topps this year, so collectors had a lot to choose from in this category. Voting for this category was the most diverse of any of the categories. All the nominated cards received ample votes, while the top three were separated by only 3 votes. It’s fitting that the winner of this category come from the most popular set of the year, 2018S2 Oh the Horror-ible. All the artists really worked hard on this set, and the results showed. There are a number of cards that will end up being memorable from this set. There were a lot more that could have easily been nominated. 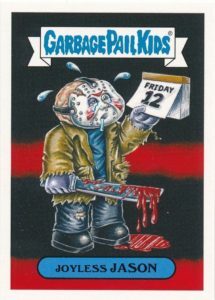 This years card of the year goes to Joyless Jason #7a in the 80’s Horror subset. The card features perhaps the most popular horror character in history. Jason is looking at a calendar and is clearly disappointed that this month the 12th falls on a Friday. It’s a simple to understand gag, while putting a funny spin on the iconic character. These are the things that will make the card memorable to collectors for years to come. Honorable mention: Pin Ed, Bob Gross, Stranger Kids Poster, Mad Paul, Hallow Dean. The 2018 GPKNews.com Best of GPK Awards, Vote Now and Win!!! 2018 marks the 2nd year of the Best of GPK awards. 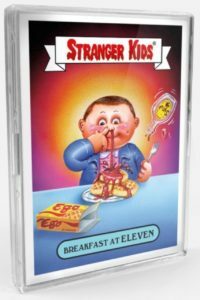 This year saw two well received US retail sets, the first two foreign GPK sets in years, a smattering of online sets, and a whole lot of new licensed merchandise. So what were your favorite things GPK in 2018? It’s your turn to help choose the Reader’s Choice awards! Not only will you be helping to choose the winners, but you can win as well! 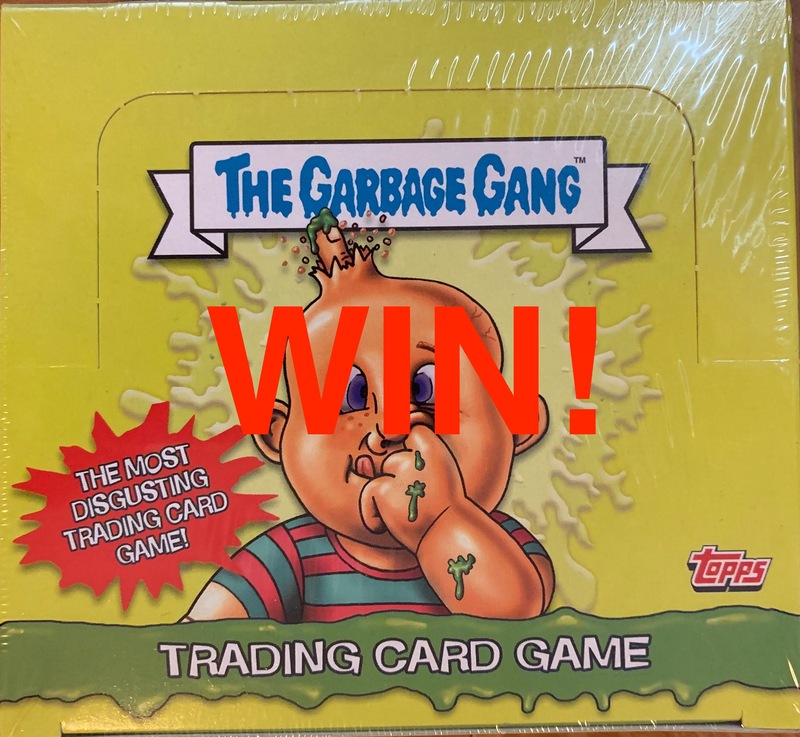 Everyone who fully completes a ballot will be randomly entered into a drawing for a sealed box of 2018 UK Garbage Gang! Click on the link below to visit GPKNews.com’s Facebook Page, and cast your ballot now! Read on for an explanation about how the categories and nominees were chosen, along with the fine print of voting. 2018 Retail Set of the Year – Four nominations this year, did you prefer one of the regular retail US sets or one of the European reprint sets? 2018 Online Set of the Year – Less sets than 2017, but still a number to pick from. Only sets released in 2018 are eligible. 2018 Licensee of the Year – 2018 was another great year for GPK merchandise. Which company did it best this year? 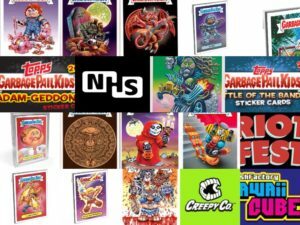 2018 GPK Rookie Sketch Artist of the Year – To be eligible an artists first official Topps GPK sketch cards have had to appear in a set in 2018. Three sets contained sketch cards, We Hate the 80’s, Oh the Horror-ible, and GPK Memes. A “rookie” might be someone new to Topps or a longtime Topps artist doing their first GPK cards. Less rookies in 2018 than in years past. All nine eligible appear on the ballot. 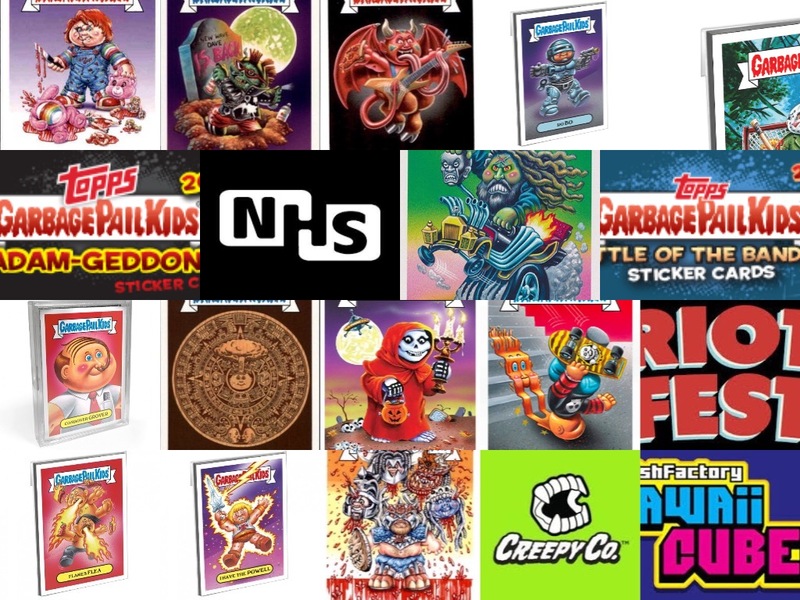 2018 GPK Sketch Artist of the Year – To be eligible an artist must have had official Topps GPK sketch cards appear in a set in 2018. Three sets contained sketch cards, We Hate the 80’s, Oh the Horror-ible, and GPK Memes. Sketch rookies are eligible in this category. Once again there were nearly 70 sketch artists that did sketches in 2018! Don’t see your favorite on the list? Feel free to choose the write-in option and vote for them! 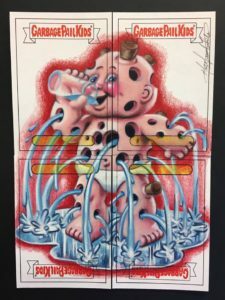 2018 GPK Artist of the Year – To be eligible an artist must have painted an official Topps GPK final published card in 2018. Retail and Online sets are eligible. Don’t see your favorite on the list? Feel free to choose the write-in option and vote for them! 2018 GPK Card of the Year – All GPKs published in 2018 are eligible. Retail and Online cards are eligible. For nomination purposes if a/b versions are available, only the “a” card is listed. There are hundreds to pick from! Don’t see your favorite on the list? Feel free to choose the write-in option and vote for them! Categories and nominees were chosen by the Editor of GPKNews.com. Categories such as best artist, sketch artist, rookie sketch artist, and best card also contain a write-in option. Write-in votes will only be counted for a valid artist/card. Voting will be live from Friday 12/14 through Friday 12/21 @ 8:00 PM. Voting will only be done through Facebook. Participants can only vote once. Vote totals or individual votes cast will not be made public. Winners will be revealed in a future article that will appear on GPKNews.com right around the 1st of January. Contest Rules: Only one vote per person allowed. Only a fully completed ballot will count as an entry. Contest is open at the same time period as voting for the awards. Winner will be randomly chosen from all eligible entries. 2017 was a year filled with Garbage Pail Kids from start to finish. Once again Topps released two retail sets. Online sets however, saw a wave of change mid way though the year. While the award show and holiday sets continued, the daily political cards were gone by summer. 2017 saw an increase in the use of the GPK license from Topps for many different types of merchandise. 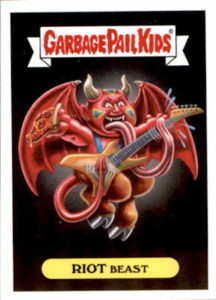 Topps also saw final card artists leave GPK, while also adding to the ranks. The number of sketch card artists saw a massive increase as each set was released. 2017 also saw the passing of former Topps artists Jay Lynch and Pat Glover. Looking back at 2017, collectors saw a very busy year. Collectors had a lot to choose from on cards and merchandise to spend their hobby budgets on this year. 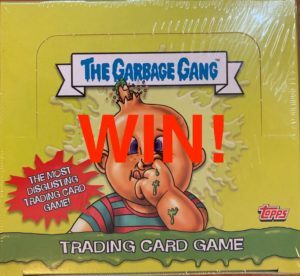 But what stood out as the best in Garbage Pail Kids for 2017? Welcome to the first annual 2017 GPKNews.com Best of GPK awards! Winners have been selected by the editor of GPKNews.com in seven categories. Additionally, a Reader’s Choice winner was also named in each category. Readers of GPKNews were able to vote in a poll on GPKNews’ Facebook page in mid-December. On some awards there is agreement, while others vary in opinion. Let the debate begin! Its time to celebrate the best in GPKs for 2017! 2017 saw the release of two retail sets. Adam-Geddon was released in January, while Battle of the Bands came out in October. Both sets saw similar levels of popularity with collectors. Each set had a handful of popular cards with collectors who chased rainbows. Both sets were configured similarly by Topps. Production was almost the same for both sets, with Battle of the Bands seeing a slight decrease in production. While the number of sketch card artists increased in Battle of the Bands, odds of pulling the “hits” from boxes remained consistent. So how do you pick a winner here? The themes for both sets couldn’t have been more different. Adam-Geddon featured GPKs in various end of life scenarios. Battle of the Bands were parodies of popular music artists in different genres. Adam-Geddon got the nod here because in the end, GPKs are “kids”. What do collectors like better than seeing than their GPKs mutilated every which way possible?! 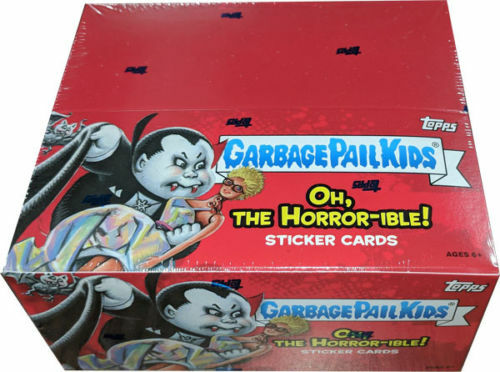 Unlike the retail category, there is a lot to choose from for online GPK set of the year. Hands down, online sets bring the most controversy in the GPK community. There were 20 total online sets released by Topps in 2017. Among those were 16 small sets, 3 daily release sets, and 1 On Demand set. This category came down to two standouts. Released in Sept., GPK Classic was the first GPK set to be featured in Topps “On Demand” category. The largest of the small online sets featured 40 cards, (20 with a/b versions), with all artwork completed by Brent Engstrom and Joe Simko. This year’s Halloween set, released in Oct., featured 20 cards (10 with a/b versions), with all artwork completed by David Gross and Brent Engstrom. Why did these sets stand out? The artwork and gags top to bottom are very good. This is some of Engstrom, Gross, and Simko’s best work of the year. You can tell there was a focus on both of these sets to appeal to the established GPK collector. These were also two of the few sets that didn’t include Wacky Packages! Collectors received only GPK love here. The Halloween set saw the highest online sales of any set this year. GPK Classic on the other hand could be a breakthrough product, that in the end might mean more to the future of GPK. Artwork done for collectors, random old school themes, the inclusion of sketch cards, are all reasons why GPK Classic wins this year’s online set of the year. When you have artists that are dedicated to the brand and are willing to push through the corporate red tape to get sets like these released, you have a winner! Honorable mention: 2017 Halloween, 2017 Best of the Fest, 2017 Summer Comic Convention, 2017 Fall Comic Convention. 2017 saw a large increase in the use of the GPK license. It was great to see Topps’ willingness to license out the brand for both classic merchandise and outside the box ideas. While Funko did not release any GPK product in 2017, other companies stepped up. Collectors saw everything from cards, posters, t-shits, jackets, socks, pins, buttons, stickers, figures, stuffed toys, and even skateboards! Once again the choice here came down to two companies. NHS Inc., the owners of Santa Cruz Skateboards, took the license and created a hugely successful skateboard line. Offered in blind bag format, the boards sold out in a matter of days, and saw huge secondary market prices for some versions. Sales of the boards appealed not only to GPK collectors, but skateboard collectors as well. So why didn’t NHS win? Creepy Co. has come out guns blazing this year, excelling with large variety of authentic replicas and new merchandise. 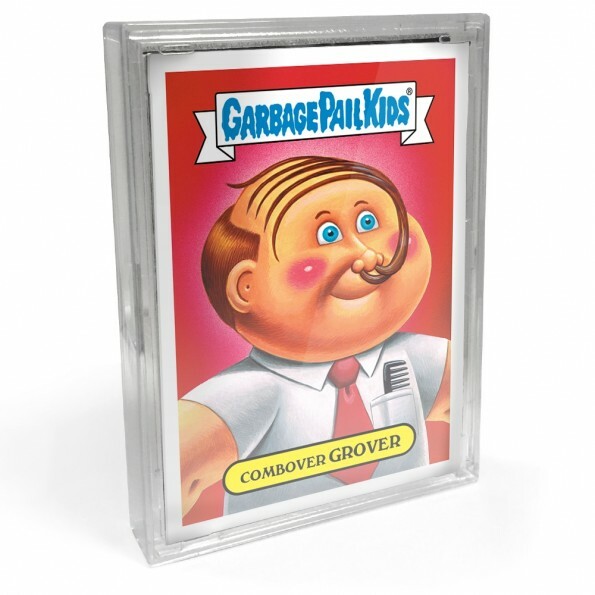 Creepy Co. has something that should interest any GPK collector. The artwork on the pins is spot on, with attention to detail standing out on everything right down to the packaging. Replicas on puffy stickers and zipper pulls from the 80’s bring collectors back to the time of buying Imperial GPK merchandise on Toys R Us shelves. 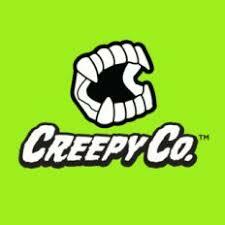 Creepy Co. also has collectors covered, literally, from shirts, to jackets, to socks. Its going to be tough for 2018 to be as good for GPK merchandise as 2017 was. 2017 might go down as the year of the rookie sketch artist. 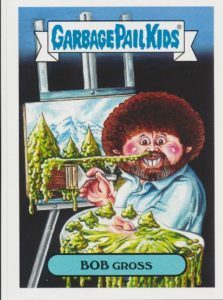 After keeping the GPK sketch lineup small for a few years, Topps has been slowly increasing the number of artists that work on a set. 2017 saw an explosion of new artists added into the mix. 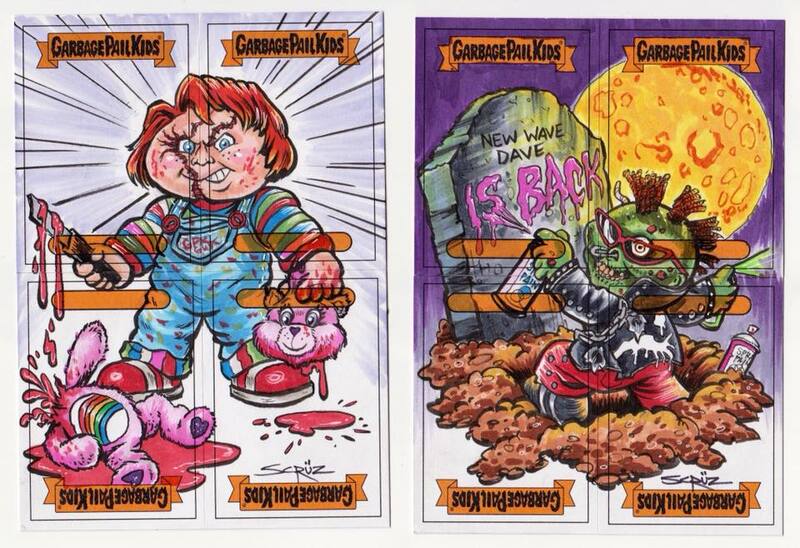 New artists made their debuts throughout the year, as there were three opportunities for GPK sketch cards this year. Believe it or not, a staggering 35 sketch artists made their debuts in 2017. Topps chose a mixture of longtime Topps’ sketch artists as well as brand new artists, most of them GPK collectors themselves. The results have been amazing. Overall the artists are fitting right in, and in some cases have already risen to the top of most frequently requested commission lists. There is no wrong answer in this category. Many of the artists could have come out on top here, and readers showed by their voting that they had their favorites. For 2017 we are giving the Rookie Sketch Artist of the Year to Matthew White. He made his debut in 2017S2 Battle of the Bands. However, Matthew has been a longtime collector, doing private commissions for quite a while. After finally being picked up by Topps, he has made his mark and has become one of the top requested artists. His sketches are constantly stunning, truly pieces of art. Its almost impossible to pick a winner in this category. What makes a great sketch artist? Consistent, beautiful work done throughout the year, going above and beyond for collectors on sketches, and timely and professional communication with collectors are just a few of the things to consider in this category. Artists had three opportunities this year to complete sketch cards, Adam-Geddon, GPK Classic, and Battle of the Bands. When adding rookies into the mix, there were 65 artists that worked on sketches for at least one set in 2017. It isn’t easy to narrow down that list to pick a winner. This one was tough, there was so much to consider. Multiple rookies rose to the occasion to be in this discussion, in addition to a number of longtime professional artists. Great Britain has a strong GPK collector base. When it comes to sketch cards the artists there certainly hold their own. This year’s Sketch Artist of the Year is Britain’s own Dan Burn Webster. After making his debut with the 30th anniversary set, DBW has been a favorite among collectors. DBW completed sketches for both retail sets this year. No matter the medium he uses, his pack inserted sketches are always a hot item with collectors. Its a labor of love for DBW as he spends time making sure each sketch is top notch. His artist returns always sell out quickly for top dollar to sketch collectors. 2018 is shaping up to be another banner year GPK collectors who enjoy their sketch cards! (Note: Numbers above might be slightly off as a handful of cards are unknown.) The numbers don’t include Wacky Packages or other brands. These artists had a very busy 2017. Not only do many of these artists paint the cards, but some of them also are an internal part of coming up with concepts. You can tell those artists who are committed to the brand. They constantly come up with concepts, and try to understand what collectors’s enjoy, while at the same time maneuvering the corporate atmosphere at Topps. This year Brent Engstrom is the artist of the year. Brent had numerous cards that stood out in both retail and online sets. Half of the cards nominated for card of the year were done by Engstrom. His work specifically on the online GPK Classic set put him over the top for this year. From top to bottom the concepts and art are an homage sets of yesteryear. If you follow Brent on Facebook, you’ll often notice him painting late into the night with a new horror flick playing in the background. Here’s to many more late nights in 2018! There were just over 500 different Garbage Pail kids released this year! From retail sets, to daily online sets, to special smaller online sets there were endless choices for card of the year. In general collectors tend to gravitate towards gore, monsters, and bones. Many of the most sought after and collected cards featured one or more of those traits. Some collectors go for a parody of a real life person, while others like the random kids. This is another category where there is no wrong answer, any number of cards could have won. This year’s card of the year is May N. Calendar from the Adam-Geddon set. The gag is straight forward, its a parody of the Mayan Calendar. However, David Gross added in Adam Bomb right in the middle with a couple of other GPK inspired heads at the bottom. The artwork on the card is very intricate. Many small repetitive details had to be painted to get the card right. Simple gag, coupled with intricate artwork, and even an appearence by GPK icon Adam Bomb, makes May N. Calendar the GPK Card of the Year. Vote Now for 2017 GPKNews.com Best in GPKs! 2017 was a full year for Garbage Pail Kids! From retail sets, dozens of online sets, sketch cards, and licensed products a collector had a lot of choices to make. So what were your favorite things GPK in 2017? Its your turn to help choose the Reader’s Choice awards! Click on the link below to visit GPKNews.com’s Facebook Page, and cast your ballot now! 2017 Retail Set of the Year – Straight forward, pick which of the two retails sets you liked best in 2017. 2017 Online Set of the Year – There were a lot to choose from, pick the best online set from the nominees chosen. Only sets released in 2017 are eligible. 2017 Licensee of the Year – 2017 was a banner year for GPK merchandise. Which company did it best this year? 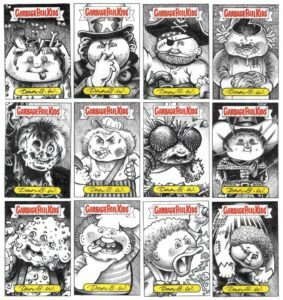 2017 GPK Rookie Sketch Artist of the Year – To be eligible an artists first official Topps GPK sketch cards have had to appear in a set in 2017. Three sets contained sketch cards, Adam-Geddon, Battle of the Bands, and GPK Classic. A “rookie” might be someone new to Topps or a longtime Topps artist doing their first GPK cards. There were over 30 rookies in 2017! Don’t see your favorite on the list? Feel free to choose the write-in option and vote for them! 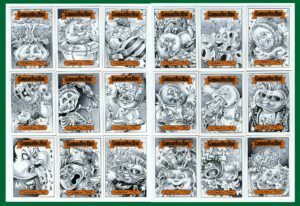 2017 GPK Sketch Artist of the Year – To be eligible an artist must have had official Topps GPK sketch cards appear in a set in 2017. Three sets contained sketch cards, Adam-Geddon, Battle of the Bands, and GPK Classic. Sketch rookies are eligible in this category. There were nearly 70 sketch artists that did sketches in 2017! Don’t see your favorite on the list? Feel free to choose the write-in option and vote for them! 2017 GPK Artist of the Year – To be eligible an artist must have painted an official Topps GPK final published card in 2017. Retail and Online sets are eligible. Don’t see your favorite on the list? Feel free to choose the write-in option and vote for them! 2017 GPK Card of the Year – All GPKs published in 2017 are eligible. Retail and Online cards are eligible. For nomination purposes if a/b versions are available, only the “a” card is listed. There are hundreds to pick from! Don’t see your favorite on the list? Feel free to choose the write-in option and vote for them! Categories and nominees were chosen by the Editor of GPKNews.com. Categories such as best artist, sketch artist, rookie sketch artist, and best card also contain a write-in option. Write-in votes will only be counted for a valid artist/card. Voting will be live from Friday 12/15 through Friday 12/22 @ 8:00 PM. Voting will only be done through Facebook. Participants can only vote once. Vote totals or individual votes cast will not be made public. Winners will be revealed in a future article that will appear on GPKNews.com right around the 1st of January.